We have two main services here at St Mary’s, which both share the same teaching, but are distinct in their styles of leadership, worship and music. Teaching series include focusing on a particular book of the Bible or a themed sermon series. From time to time, for special events, we have United services, where both congregations gather to worship together. 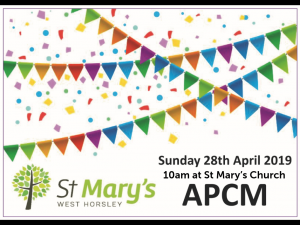 APCM officially stands for ‘Annual Parochial Church Meeting’, but we think it should be more like the ‘Annual Party Celebrating Ministry’! We’re starting at 10am with bacon sandwiches and fresh tea or coffee, followed by worship, a chance to review the year, hearing from people involved in the church. We’ll also elect new leaders to the Church Council and thank those who are stepping down. Our 9am is a Traditional Morning Prayer Service with communion twice a month and organ or piano led music. Coffee and refreshments are served after the service. There are no Children’s groups or activites but there is a kids corner with books, games and toys which you are welcome to use. Our 10.45am is a Contemporary Family Service. Musical worship is band led and there are childrens groups for 0-15 years old. Communion is held on the 2nd Sunday of the month and prayer ministry is always offered. Coffee and refreshments are served at the end of the service. Click here to find out more about our Children’s Groups.